Day 42, BUS 1. Bucharest: good bye EMIN BUS, welcome adequate minimum income! The last stop of the EMIN BUS in Romania was Bucharest, where we had a public event in the morning, at the Infoeuropa Center and a happening around the bus in the afternoon. 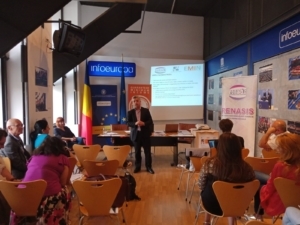 The public event rounded up the debate about Minimum Income Schemes in Romania. Different representatives of Social Work Departments from the Municipality level, who are at the forefront of implementation of minimum income schemes participated in the event and enriched the discussion with valuable insights and recommendations for change. At the heart of the debate held in Bucharest was the need to urgently change and upgrade current minimum income schemes, which are far from providing adequate support to people in need. One of the social workers present in the room who has been in charge of the implementation of minimum income schemes for more than twenty years and has witnessed the different changes in the legislation of minimum income spoke about the worrying decrease of the number of people accessing minimum income schemes. She put in front of the audience a rather sobering image. In the district where she works, in 1995 there were 1500 beneficiaries of minimum income, in 2001 there were around 300 – 400 beneficiaries and in 2018 only 50 beneficiaries. When analyzing this trend against the backdrop of other statistical data and evidence, the conclusion we draw is not that the number of people in need of minimum income has decreased but that less and less people in need apply for this form of support, meaning that a high number of people in need are been left without any form of social support. The main reasons for which people feel discouraged to access minimum income are its low value and the burdensome administrative effort that people need to make to apply for it; they need to submit an application that consists of a considerable number of documents, they have to willingly subject themselves to periodical assessments, they have to bring monthly evidence that they are active within the local unemployment agency, and last but not least the number of compulsory community work hours they need to put in. Representatives of social work departments of municipalities also spoke about the fact that the whole bureaucracy around accessing minimum income schemes changes the nature of work for the social workers in charge as they become managers of paper files instead of providing guidance and support to people accessing minimum income. 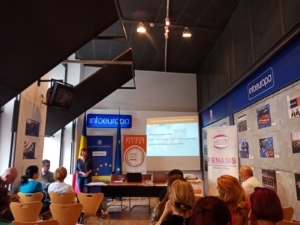 Another important issue discussed at the event in Bucharest was the monthly compulsory work hours that people using minimum income schemes have to put in for the benefit of their community, as a condition to receive minimum income. Despite its activation objectives, the measure has been subject to substantial criticism for many reasons: it often turns into exploitation, the nature of work is quite often degrading and it does not equip people with the skills they need to access jobs on the current labour market. Another reason participants mentioned was the fact that it is not ethical to ask people to work for social benefits and that work needs to be properly remunerated in the framework of an employment contract. 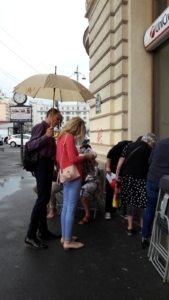 In the afternoon, despite the summer rain that kept most people inside, a happening was organized around the BUS that was parked in front of the Romanian Atheneum. Due to the rain we could not stick to the original plan of organizing the event right next to the BUS and had to hide next to a bank office to protect ourselves from the rain. In the end we spent more than two hours outside in one of the central areas of Bucharest talking to locals and tourists about minimum income.